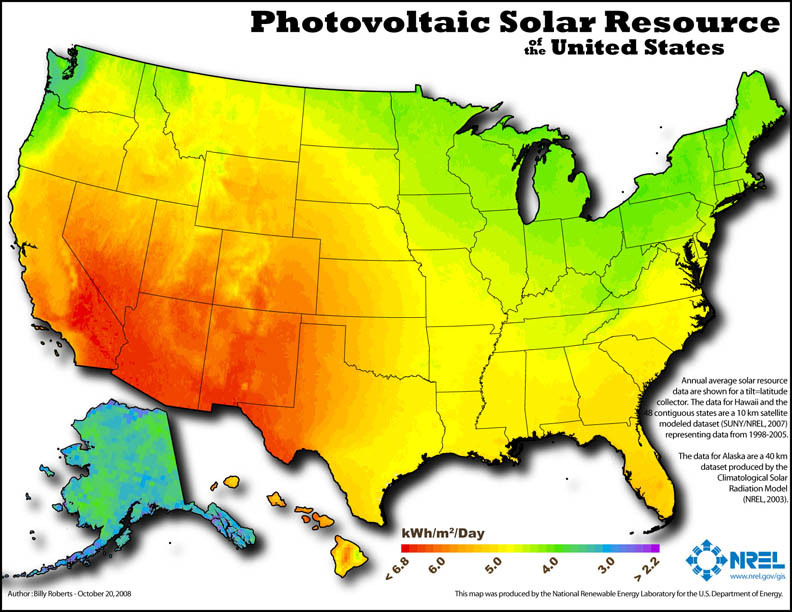 The political implications of maps of US renewable energy resources. A follow-up to Matt’s post on the political geography of carbon taxes. Iowa now gets 20% of its electricity from wind, almost at the Danish level. When Iowa farmers look at wind turbines, they don’t see a visual nuisance blocking the noble horizons of the Plains, they see the wings of busy geese laying golden eggs of rent. 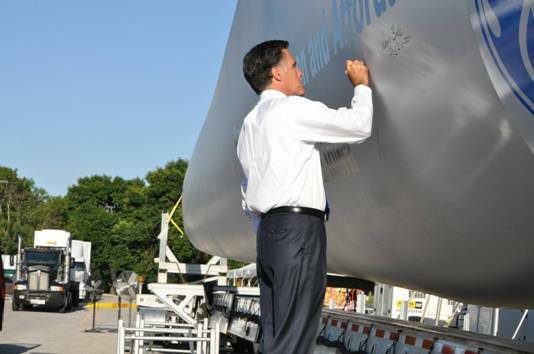 Politicians can no more oppose tax credits for wind energy in Iowa than the boondoggle of subsidies for ethanol. Other renewable energy industries also vest interests in rents and jobs and probably create identification. How is this growing producer effect likely to play out over the coming decades? 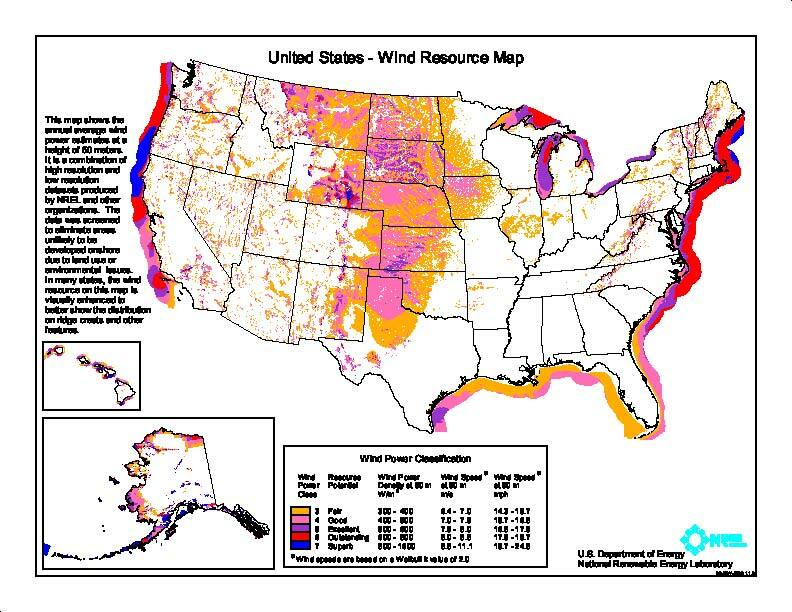 The NRELÂ has a nice set of maps of US renewable energy resources. I’ll reproduce a few below the jump. You can download others, and hi-res versions. (Warning: quite large page). At present geothermal is is numerically insignificant. I put it in because I bet this will change. Geothermal is the Mercedes of renewable energy: it’s expensive but top quality. Ãslandsbanki (the Icelanders are experts on this) give the capital cost per kw capacity at $4,000, against $2,600 for solar PV and $1,900 for wind. 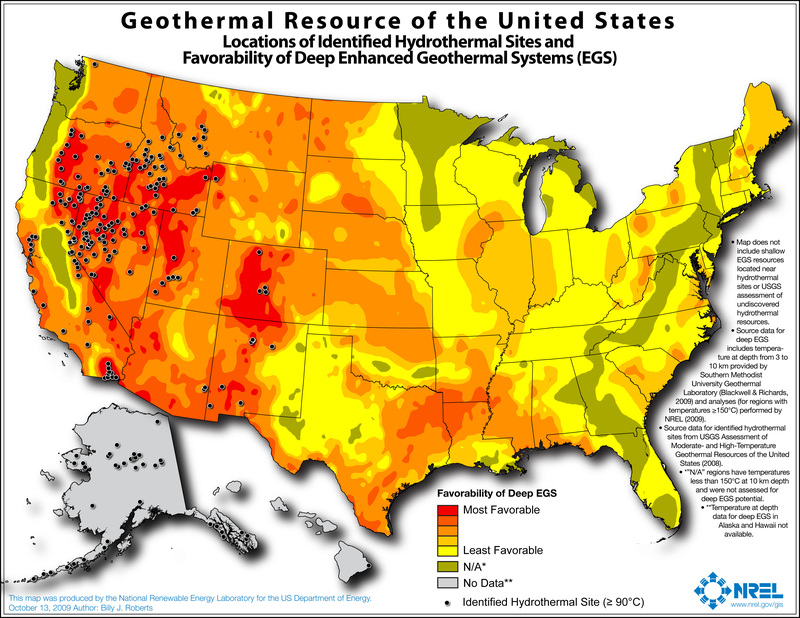 Since the big cost in geothermal is drilling, a mature technology, geothermal costs aren’t likely to come down as fast as those of its rivalsÂ are doing. However, with hot dry rock fracking , there is orders of magnitude more recoverable geothermal energy than used to be thought. It’s technically beautiful: reliable (95% capacity factor, beating everything else), safe, frugal with land. As we push the load management envelope with cheap but variable wind and solar, geothermal will compete with storage for the high-cost zero-carbon baseload. For a taste of geothermal’s future, check out this Australian consultant’s newsletter. This is no longer a a research field but a buzzing baby industry, complete with boosterism, takeovers, stock-market warnings, and talk about “plays”. I’ll leave out biomass, because it’s either marginal (sewage and sawmill waste), a boondoggle (corn ethanol) or dependent on unpredictable future technologies like fermentation from cellulose using GM-ed bugs, far too uncertain to draw a resource map. Take my three resources, together more than enough to meet all US energy needs. The overall picture is clear. Colorado has everything. South and West of Colorado has solar. North-East of Colorado (the Plains) has wind. The Rockies have geothermal. The Northeast has nothing apart from offshore wind (which generates temporary construction jobs but not rents). 1. The transmission costs of electricity, on a par with those of oil and gas, are low enough that price differentials are unlikely by themselves to drive settlement patterns. But the concentration won’t do anything to stop the demographic and economic shift to the Sunbelt. 2. The concentration of renewable resources in largely Republican regions may help explain the relatively slow take-up of renewable energy in the USA compared to other developed countries, and the continuing opposition to carbon taxes. However, their rapid development will erode this opposition. 3. If the Democrats play this right (especially ensuring that landowners and local communities benefit) and the Republicans wrong (following denialists rather than Schwarzenegger), the situation offers an opportunity for the Dems to erode Republican support in its heartland. 4. The politics of the national electricity grid, making very slow progress, are made much more difficult by the regional divides. It’s only essential to the North-East. PS While I’m about it, my simple hydraulic model of energy politics predicts that the Keystone XL pipeline will never be approved. The green forces against were just strong enough in 2011 to get it suspended. Suppose a revised route comes up for decision in 2013. These forces will be that much stronger: reflecting gigawatts more of wind and solar farms and their supply chains, and a significant fleet of electric cars. Colorado also has the outdoors and mountains and calm people and good microbreweries and bike culture and and and. But it doesn’t have everything: water is generally scarce. Am I missing something in the definition of “renewable”, or is there some other reason why there isn’t a hydroelectric map here? The great majority of useable hydro power is already used. So, hydro power provides neither scope for replacement of other resources nor jobs; little construction is going on, and a running hydro plant requires very few people. These things make its political impact negligible. I dunno if the North-East is the only area that need the national grid. It looks as though the south needs to tap into the western power sources too. The SE has solar, but not the others. So it’s grid or storage or cheating with gas turbines. But the SE does have offshore wind. So it is not an insuperable problem. They already have at least some of the water resources for pumped storage (dams, lakes etc). National grid? We don’t even have a solid California-Pacific Northwest grid. Dan has identified a key resource in the whole scenario: water. As scarce as it is at times in Colorado, that scarcity flows downstream . In terms of solar, one item these maps don’t quite take into account, at least for photovoltaic panels, is that while the panels lap up sunlight, they aren’t nearly so fond of heat. I know for my own panels (Mid_Atlantic Rooftop), that top producing days are in those glorious sunny, cloudless spring days of April and May. If one is using solar to produce feedstock to heat up salt or boil water, it is a different set of circumstances. For wind, places like Colorado, the mountains produce a lot of long lasting wind gusts that would require those large turbines to go “off wind” . Different technologies might be able to harness that power. As far as transmission goes, while the $ costs of transmission may be comparable to other resources, the losses of power over long distances are staggering. Even the trip in from the transformer to electric panel can result in 10-20 losses according to my local power provider. So as “smart” as we might be able to make a grid in terms of load shifting, there’s something inherently not so smart about long distance transmission. In terms of the Northeast being a beggar but for that “not rent producing” areas off the coasts, I agree that the model for incentives is not so simple as the easy “private” rents in Iowa. I am not as convinced that the only benefits there would be construction jobs. One other thing that often is overlooked is that incentives for alternative energy policy can be quite localized. When I lived as a customer of Colorado Springs Utilities, the max amount of subsidy for any type of solaar project was about 3K. Other parts of the state did better. Here in Delaware, the incentives were and still are quite good, although one may have to wait awhile for the fund to be replenished. But again, even in this state, it depends who is one’s electric provider. Wind turbines run at near hurricane speeds. Certainly over 100mph. Do mountain gusts run to that level, regularly? (we had a wind turbine in Scotland explode the other day at something like a 160mph gust, the highest land speed for wind in Scotland was recorded that day). ‘power transmission loss over long distances is staggering’. Someone should warn Quebec Hydro because they move power to the New York and New England grids over 1000 miles. Americans don’t make much use of long distance DC transmission but Africans, Brasilians, Russians and Quebecois certainly do. The UK loss figure is 7% including distribution and transmission losses. On Colorado and renewable energy. A key factor is that most renewables don’t use much water. Wind certainly doesn’t, nor solar (geothermal might). On heat and solar panels, agreed an issue. But there are now combined solar hot water/ solar PV panels which, as a bonus, pipe the heat away out of the panels. It’s probably an area ripe for product improvement. A panel (1 kw peak) in the southern UK will produce c. 850 kwhr pa. In Italy outside of Florence, closer to 1500 kwhr pa. so the heat problem is not insuperable. Water is a constraint on settlement, sure, but for renewable energy specifically? Wind and solar PV don’t need any. Geothermal either taps underground steam or hot water, or uses a small amount for injection into hot dry rocks in a closed cycle – the large Australian projects are taking place in deserts or near-deserts. Solar concentrating may similarly use water as a working fluid, potentially in a closed loop, or cut it out entirely with a hot-air turbine (Brayton cycle). Can somebody knowledgeable please respond on transmission losses? New England already imports electricity from Hydro Quebec via HVDC lines which total >1500 km from James Bay. From a carbon-footprint point of view, transmission losses of renewably-generated electricity are a shrug. James, water is needed for every aspect of civilization, including manufacturing which we are getting more green manufacturing here in Colo. Transmission losses vary with temperature and load and 10% losses are significant, but the costs and visual impact of a new network of transmission lines are slowing concentrated solar development in Colo. Trinchera Ranch would not approve a transmission ROW on its land (I can’t blame them either), dealing a blow to our Renewable Energy Standard. Distributed Generation is much more efficient all the way ’round, with lower footprints from no long-distance transmission. Ok so now we’ve quit worrying about water. Yes the visual impact of electricity transmission lines is a *big* issue. It is, mind, for whatever energy technologies we adopt, but particularly renewable ones (where the power tends to be generated a long way from the demand). Insupperable? Surely not. Consider the plan for an underwater cable in Lake Champlain, to get hydro power from Quebec to NY/NE markets. Something similar off the west coast of Scotland. For the places with the wind, like the US Great Plains, this whole industry is such a no brainer because it generates cash flow largely uncorrelated with anything else. In fact, it is a utility business: a business which long run produces relatively stable returns (averaged out over the long run) after capital intensive investments. There is one potential problem with hot dry rock if used in populous regions: induced earthquakes, which stopped a project in Basel. Not such an issue for the Australian desert. Basel was a very bad choice of site, made in the early days of EGS: it’s on top of a fault, with a major earthquake in historical times (1356). The induced tremors were at most Richter 3.4. The damages claimed (presumably padded) were $8.3m, with SFIK no deaths or serious injuries. Is there any reason to think that any current projects, whose proponents and regulators have learnt from the Basel incident, pose seismic risks? From skimming geothermal websites, I don’t see evidence of chronic problems with getting insurance. Munich Re and company apparently think it’s OK. Compare nuclear power where the insurance market in the US is rigged by law. Basel canton is tiny and almost all urbanized. My reading is that local pride created a risk which can be easily avoided anywhere else by just moving ten miles out of town – not much of a problem in the Rockies. You don’t need a desert to make the damage risk shrink from very small to negligible. Soultz-sous-ForÃªts in Alsace (pop. 2,693), home to the European EGS research site since 1987, has experienced 50,000 tiny tremors, and ten or so detectable without instruments, but with no reports of damage claims in spite of the strong incentive to make them. Break every window in the village and you couldn’t spend $8m replacing them all. 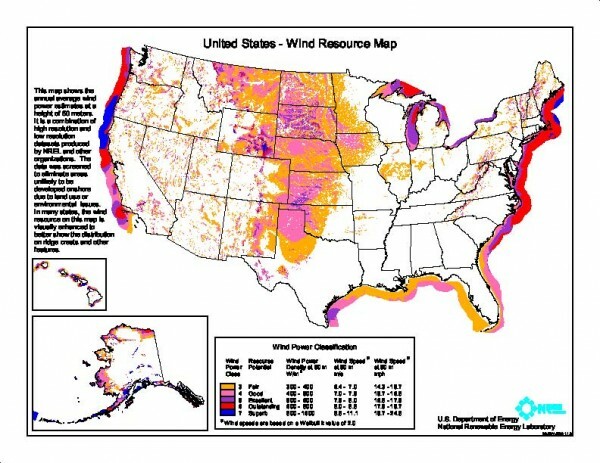 As a long time reader, I wanted to share http://maps.nrel.gov/ which has a number of interactive map applications where you can do analysis on the scenarios mentioned in the comments above. You need to include the impact of shale gas, shale oil, Coal Bed Methane gas etc. as well. On that basis, the ‘core’ Red states are still going to be pro fossil fuel. Oil is big money in those states. The old green v. red split will of course continue, but the fossil fuel crowd is politically far more organized, focused, punches a bigger weight.